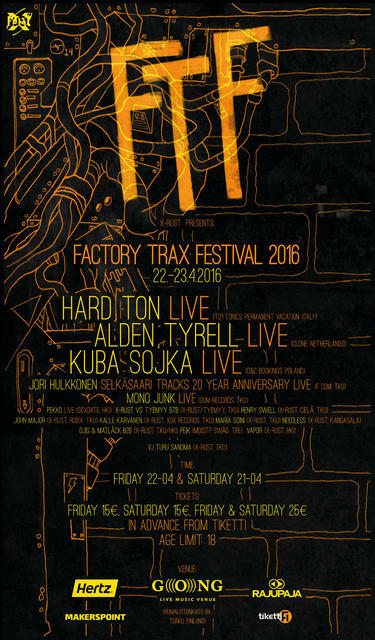 Factory Trax Festival 2016 takes over Turku's fresh, new live venue Gong on the 22nd and 23rd April. The fourth instalment of the electronic music festival organized by The X-Rust Organization features the first ever performances in Turku by the Italian duo Hard Ton and Polish Kuba Sojka as well as a live performance by Dutch Alden Tyrell. Representing the best of Finnish electronic music are veterans Jori Hulkkonen and Mono Junk as well as rising talent Pekko. In addition to the beforementioned six live performances, a total of 16 deejays play on three separate stages over the course of the two day festival. Impressive visuals and decorations crown the festival experience.